A day late this week, probably because there don’t appear to be enough hours in the day at the moment! Unfortunately we start with the sad news that Jeff Mimnargh died in hospital last Saturday. Jeff was a member of the LRC and LRS in the very early days (membership number 0075) who lived at Leyland and was a regular at the Friday evening get-togethers in the Railway Inn at Lostock Hall. He rejoined the FRT after the purchase of Wootton Hall. We are also very sorry to have to record the death of RSR member Jimmy Gardner, who helped out the FRT with his white metalling skills. Jimmy’s funeral will take place at Blackpool Crematorium at 10.00 on Friday. We offer our condolences to both Jeff and Jimmy’s families. Turning to FRT projects, there was further progress to report at Preston last week. Tim finished off the gloss coat of grey on the mess cabin, which just awaits the yellow on the corner posts once the correct shade of yellow is found to John’s satisfaction! This is a project that has taken many weeks in between other pressing needs in the shed and has been thwarted by extremes of weather – either too hot or too wet! And many people have been involved, so thanks to all of them. It has been a job worth doing and certainly makes the place look tidier. 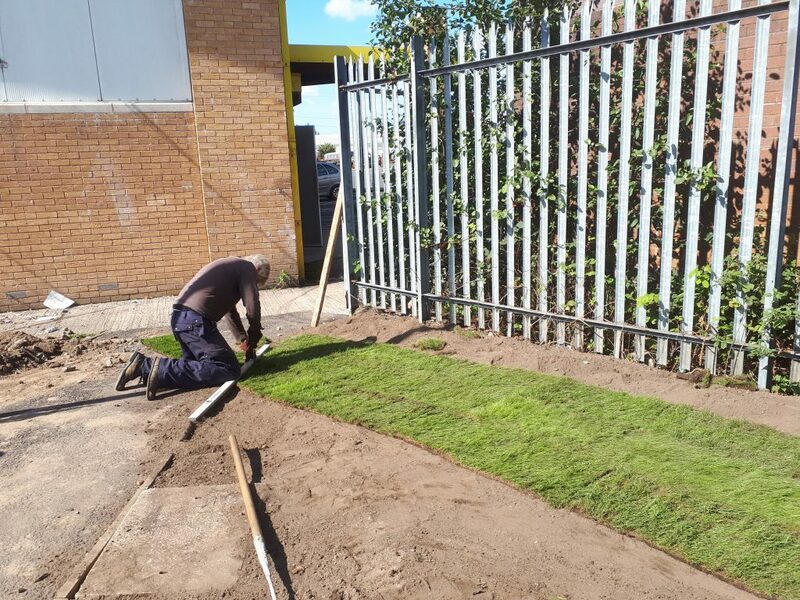 Also making a welcome improvement to the local environment has been Ed Tatham who has been working to create a garden adjacent to the children’s playground and alongside the walking route to the FRT shed. Ed is seen here lying turf which would certainly not be out of place at Wembley. 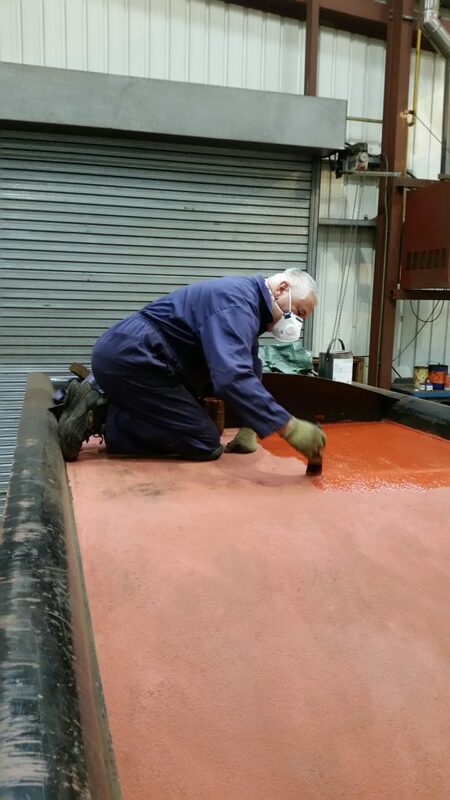 John Dixon did a final clean up of FR 20’s tender coal space on Wednesday before applying a coat of red oxide. A second coat of red oxide was applied on Friday by John Davis, seen here with the paint brush. Adrian and Howard have again been busy with Caliban, with Adrian tidying up the paintwork between the frames. He has also been doing some work on FR 20, undoing the boiler expansion bracket screws ready for the time when the boiler will be lifted. 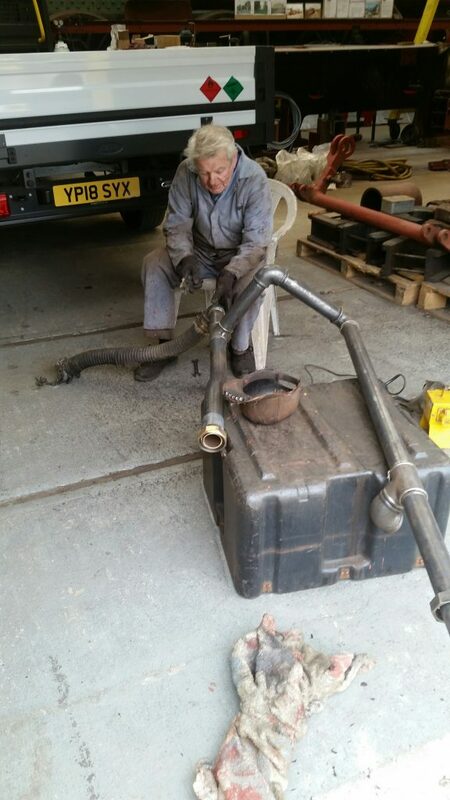 Keith has continued to have a frustrating time at Embsay preparing the surface of 5643’s smokebox to receive the regulator box. Keith and Adrian are now due to go to Embsay this Wednesday to continue the work. Fred made further progress with cleaning up the components removed from FR 20, this time cleaning up and priming the engine’s vacuum pipework. Mike and Paul Newton spent more time on Friday with the delinquent extractor fan in the former FRT RMB before casting another couple of resin plates. Finally there was a good representation from Preston at Crewe Crematorium on Friday for Dave Manley’s funeral. There were also representatives there from Crewe Heritage Centre where Dave was also a member.